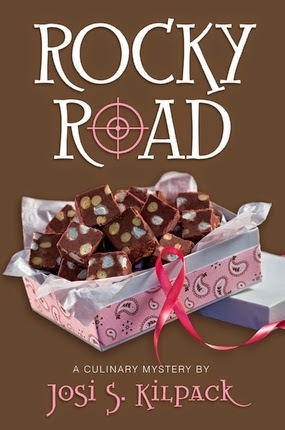 Rocky Road is the tenth "culinary mystery" by Josi S. Kilpack featuring Sadie Hoffmiller as a former private investigator, general unintentional meddler and all-around solver of mysteries. And it's a Whitney Award finalist in the Mystery/Suspense category. While Rocky Road certainly hinted at events that occurred in previous books, it was fairly self-contained story. In other words, I didn't feel that I missed out on much starting with this one, even if there were nine earlier installments. Sadie is on a "girls weekend" in St. George, Utah, with her friend Caro. The itinerary includes shopping, girl time, and helping with a breast cancer fund-raiser. One of the organizers of the fundraiser, a well-loved local physician, disappeared a couple of months earlier and, unsatisfied with the unsuccessful efforts of the town's police, Caro wants Sadie's help investigating the disappearance. Cautious because of recent experiences (which I'm sure are described in the last book in the series), Sadie declines Caro's persistent request that she get involved. Eventually, however, she finds herself drawn in, despite her desire to steer clear, when she meets the good doctor's ex-wife while helping to prepare the luncheon for his memorial and strikes up a sympathetic conversation. At the memorial, his current wife appears "a little bit too composed" and arouses Sadie's suspicions more. The pieces just aren't adding up, so Sadie starts asking more questions. You see, Sadie believes that "truth is important" and "I found that I could discover important information and help find the answers that might help people." Good reasons, I think. As any good mystery does, this one has clues, puzzles, twists and turns. People turn out to be not as they seem, both for good and evil. The mystery is solved neatly in the end and the bad guys get their comeuppance, though not without some additional heartbreak on several fronts. Rocky Road was a pleasant, somewhat frothy diversion for a day. I'm not so engrossed that I'm going to run out and read the rest of the series, but I may pick up another when I need something light. Of course, as a Whitney Award finalist, it's a given that the author is LDS, but the way Mormon references were included in this book - the character seemed fairly unfamiliar with the terminology such as "ward" for a congregation and looked forward to touring the grounds of the LDS temple in St. George - it seemed like she hadn't incorporated much into earlier books. I wonder if this was a change from her previous writing and if long-time readers found it a bit jarring. And yes, I copied out a couple of the recipes including a knock-off of Cafe Rio's Barbacoa Pork and Cilantro Lime Rice, and Granny Anne's Rocky Road Fudge.